In the past week, Delta Air Lines DAL kick-started the fourth-quarter 2018 earnings season for the airline space. This Atlanta, GA-based carrier reported better-than-expected earnings but lower-than-expected revenues. For the first quarter of 2019, Delta’s earnings guidance lagged expectations. Consequently, the stock shed value following the quarterly results despite outperforming on the bottom-line front. Moreover, Delta said that its business is suffering due to the partial federal government shutdown, which is now officially the longest on record (having turned 25 days on Jan 15). As a result of lower government travel, Delta’s revenues are likely to be hurt to the tune of roughly $25 million in January. Launch of its new Airbus A220 jets is also likely to be delayed due to the partial shutdown. Meanwhile, United Continental Holdings UAL outperformed with respect to earnings and revenues in the fourth quarter. For 2019, the company expects earnings to be between $10 and $12 per share. The Zacks Consensus Estimate is pegged at $10.65. 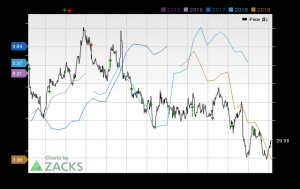 American Airlines Group AAL was another major newsmaker over the past five trading days, courtesy of its decision to trim earnings per share view for 2018. The airline behemoth also stated that fourth-quarter unit revenues are expected to inch up approximately 1.5%, which is at the lower end of 1.5-3.5% projected earlier. American Airlines is slated to release its fourth-quarter and 2018 results on Jan 24. JetBlue Airways Corporation JBLU and Hawaiian Holdings’ HA wholly owned subsidiary Hawaiian Airlines too grabbed headlines as they released respective traffic reports for December. Load factor (% of seats filled by passengers) declined at both carriers as traffic growth was outpaced by capacity expansion. 1. Delta’s fourth-quarter earnings (excluding 19 cents from non-recurring items) of $1.30 per share surpassed the Zacks Consensus Estimate by 3 cents. Moreover, the bottom line increased on a year-over-year basis. However, operating revenues of $10,742 million fell short of the Zacks Consensus Estimate of $10,828.7 million. Revenues increased 4.9% from the year-ago figure (read more: Delta Air Lines Q4 Earnings Beat, Revenues Lag). Delta carries a Zacks Rank #2 (Buy). You can see the complete list of today’s Zacks #1 Rank (Strong Buy) stocks here. 2. 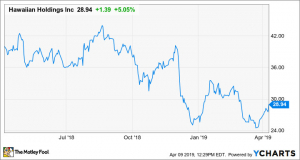 United Continental’s fourth-quarter earnings (excluding 71 cents from non-recurring items) of $2.41 per share surpassed the Zacks Consensus Estimate of $1.86. The bottom line also increased significantly year over year owing to higher revenues. Operating revenues came in at $10,491 million, which outpaced the Zacks Consensus Estimate of $10,369.9 million and improved 11.2% on a year-over-year basis. Consolidated passenger revenue per available seat mile (PRASM: a key measure of unit revenues) increased 5% year over year to 13.87 cents in the final quarter of 2018. The company anticipates first-quarter 2019 capacity to expand between 5% and 6%, while pre-tax margin (adjusted) is estimated to lie between 2.5% and 4.5%. Passenger unit revenues are anticipated to either remain flat or increase up to 3% year over. Meanwhile, consolidated average aircraft fuel price per gallon is envisioned between $2 and $2.05. Effective income tax rate for the quarter is likely to be in the 21-23% range. For 2019, capacity is estimated to expand in the 4-6% range. Adjusted capital expenditures are projected to be approximately $4.7 billion. 3. American Airlines’ bleak guidance for fourth-quarter unit revenues was due to lower-than-expected improvements in the domestic market year over year. However, with oil prices on a downtrend, the carrier trimmed its fourth-quarter forecast for average fuel prices per gallon. The metric (inclusive of taxes) is now anticipated between $2.22 and $2.27 (past view: $2.30-$2.35). The company continues to predict non-fuel unit costs between -1% and +1% (year over year). Additionally, American Airlines still envisions fourth-quarter adjusted pre-tax income in the band of 4.5-6.5% (read more: American Airlines Stock Falls on Bleak Q4 Guidance). 4. At JetBlue, traffic — measured in revenue passenger miles (RPMs) — increased 6.8% year over year to 4.35 billion. Consolidated capacity (or available seat miles/ASMs) expanded 8.5% to 5.35 billion on a year-over-year basis. The company now anticipates fourth-quarter 2018 revenue per available seat mile (RASM) to climb around 2.4% year over year, within the previously guided range of 1.5-3.5%. The view includes 0.3 points adversity due to higher-than-expected completion factor. Detailed results will be out on Jan 24 (read more: JetBlue's December Traffic Rises, Load Factor Falls). 5. At Hawaiian Airlines, December traffic increased 5.1% to 1.46 billion. Capacity expanded 5.6% to 1.74 billion in the same period. For the fourth quarter of 2018, results of which will be out on Jan 29, the carrier now anticipates RASM to decline 3-4% year over year. Earlier, the metric was expected to decrease in the range of 3-5%. 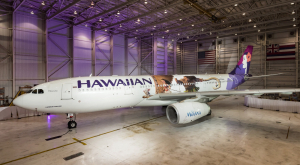 This slightly improved projection can be attributed to higher yields on the carrier’s international routes and a strong holiday traffic on its North America routes (read more: Hawaiian Airlines Reports Lower Load Factor, Alters Q4 View). 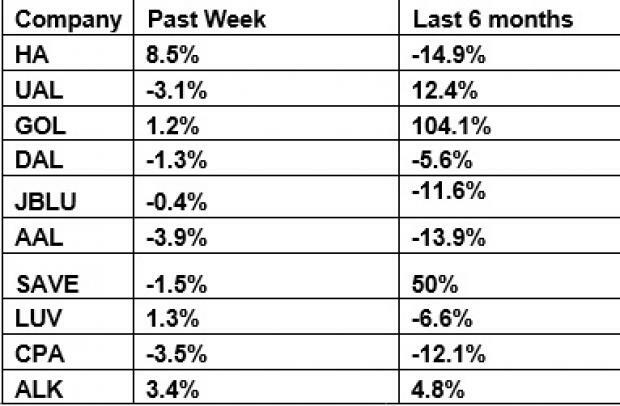 The table above shows that majority of the airline stocks traded in the red over the past week leading to the NYSE ARCA Airline Index’s approximately 1% decline. 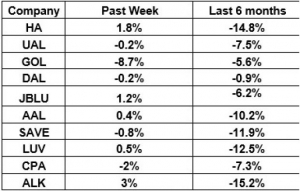 Over the course of six months, the sector tracker decreased 4.8% despite impressive gains at the likes of GOL Linhas GOL and Spirit Airlines. Investors will look forward to December traffic reports from the likes of Copa Holdings CPA in the coming days.